Our three day passage from the Vava'u group of Tonga to Suva, Fiji was sort of a challenge, but also a delight. As we left Tongan waters, we had to motor, and when we did find wind, it was from the southwest. We found ourselves beating west! But the winds were light, and stayed that way for awhile, so we got used to the unusual situation and gloried in the clear days and nights. We made the passage through the treacherous Lao Group in eastern Fiji at first light, like we had planned, and sailed on west to Suva with following winds for the next day and a half. The first couple of these newsletters are what we emailed out while we were actually underway, except that now they're illustrated. After those, the newsletters are what we sent (without the pictures) during our months cruising in Fiji. The cruisers' letter is a copy of what we sent to the Seven Seas Cruising Association Bulletin for publication after our visit to the Mamanuca and Yasawa Islands during cyclone season. Jon, our intrepid engineer who claims he can't write, wrote most of them. We sailed through the Lau Group from Tonga, but were not allowed to stop. 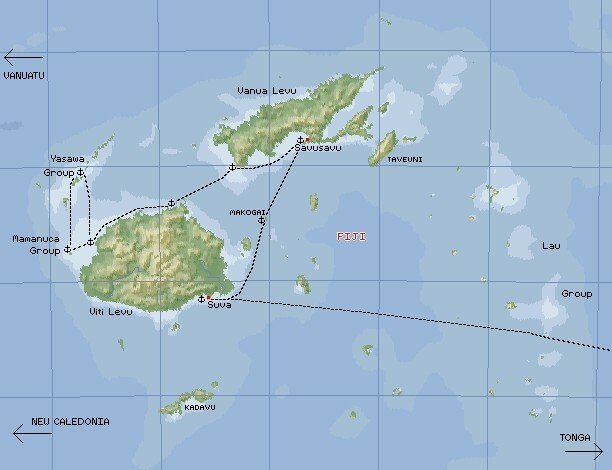 We actually sailed between Suva and Savusavu 3 times, stopping in Makogai each time. Grid lines are 1 degree, or 60 nautical miles. Wed 6 18° 27' 178° 52'W 160 155 Shake the reefs and put up the chute!